The Flotec water pressure tank stores energy in the form of compressed air. The air in the tank pushes the water through the water lines at a set pressure; this device is what determines your water pressure. Inside the Flotec water pressure tank is a bladder. The water goes inside the bladder and the air around the bladder pushes the water out of the bladder, creating the water pressure. There are a few steps to troubleshoot your pressure tank to check if the bladder has failed or if you need to add air to the tank. Turn the power off to the water well pump, either at the disconnect or at the main electrical panel box. Turn on the faucet to release the pressure in the water lines. Check the pressure in the tank, using a tire pressure gauge. Push the tire pressure gauge onto the valve stem on the top of the pressure tank, also called a schrader valve. The valve stem is like the valve stem on tires. The pre-charge pressure should be 2-psi lower than the start pressure, which is the pressure switch setting. (See Tips below for common settings). Push the valve stem in, using the back of the tire pressure gauge, to release the air from the pressure tank, if the pre-charge pressure is too high. Connect a bicycle tire pump to the valve stem to add air, if the pressure is too low. Release all the air in the tank through the valve stem, to check if the badder has failed. 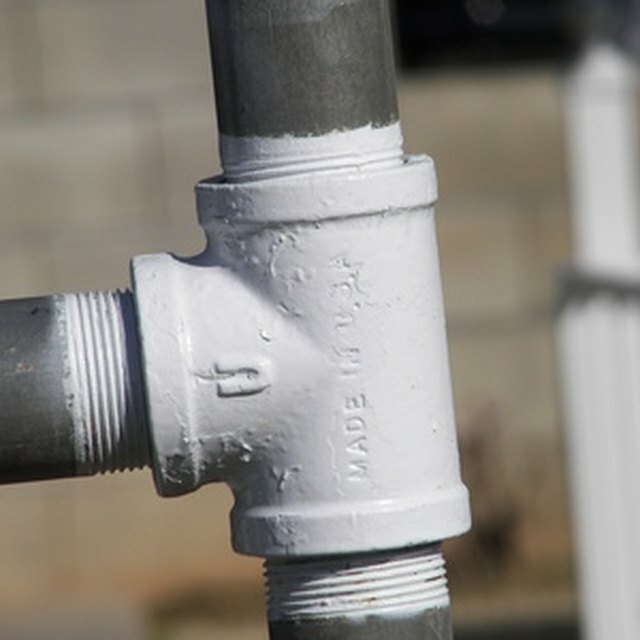 Disconnect the water pipes, using a wrench. Carefully turn the tank upside down. If water leaks out of the valve stem, then the bladder has failed.